Dream. Dress. Play. 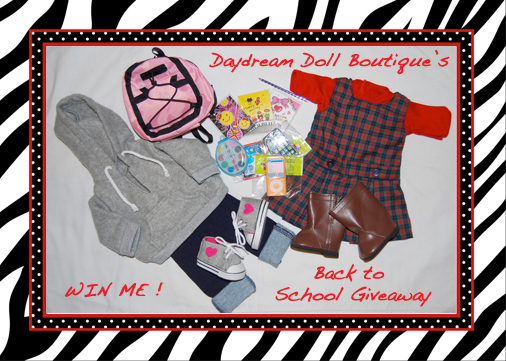 : Enter our Back to School Giveaway ! Go to the Daydream Doll Boutique website and take a look around. Come back here and leave a comment telling us: your favorite Shoes and what you would pair them with. I follow! My favorite shoes are the Zebra Stripe Sandals! I would pair them with the Black Floral Party Dress! I am entering, I follow you, my favorite shoes are the pink fringe boots, and I would definelty pair them with you outfit Color Trends. I posted about it on my blog ! I like then pink fringe boots with the Style so sweet outfit! I emailed two friends! I posted about it on my blog! Hi. I follow and would like to enter, please. My favorite shoe is the classic zip boot and I would pair them with the denim ruffle dress. Thank you. Hi again. I've just emailed the info about your give away to a family member. Thanks. My favorite shoes are the Sparkle Sneakers and I would pair them with the Hello Kitty Stripe Dress. I forgot to add that I'm a follower (Sophie Trahan). I LOVE the Girls Rock with the Black Lace Boots!!! I told all my friends about it and I posted it on my Blog. I follow and I would pair the glitter sneaker with the silver chic outfit. Love the Glitter Sneakers! They'd be so cute with the Ruffle denim dress! I emailed to my friend. I e-mailed it to my niece and daughter! I've just shared your link on Facebook, too. I posted it on my FB page and I let my friends at work that have daughters know about the giveaway. Thanks for this amazing giveaway! I'd love to enter! I like the suede button boot and would pair them with leggings. I would like to enter! I follow! I have permission! I like the pink fringe boots and to pair with them,the pretty in plaid outfit! I pinned it on pintrest with the username Funwithagfan! I emailed a friend! Put them with Snowflake Leggings Outfit. I really like the zebra stripe sandals and I think I would pair them with the zebra swimsuit. They would go nicely together right? Hi! I would like to enter, and I have my parents' permission! My favorite shoes are the fringe boots (they're so cute!!!! ), and I would pair them with the trendy tunic outfit!! I would like to enter, and I have my parents' permission! My favorite shoes are the tan suede button boots, and I would pair them with the pretty in plaid outfit! I followed. I love the Ultimate boots paired with the girly punk. I like the Pink Fringe Boots with the Ruffled Heart Outfit! I LOVE the "Ultimate Boot" in Black, paired with the Scary Monster High outfit! So cute and trendy! I also shared the Give a way on my facebook page! I like the flower summer sandal and would pair them with the glitter heart tee outfit. The classic zip boots would be cute with the ruffle denim outfit (too bad it is sold!) and also the Trendy Tunic. I know it's on the front page, but I love the whole outfit you have for the Whoo's so Cute, right down to the tan suede boots. I would dress my daughter in that outfit! I am new to American Girl 'stuff'!! My dear friend has a lovely daughter who is 11 years old named Sydney. She has cerecbral palsey and plays with her American Doll everyday! She asked me, as she knows I love to sew, if I would make her some doll clothes as money is an issue and it would be a way to save a little but still have some nice doll clothes. So, I have been busily searching the internet for all things American Girls, and happened upon your site via Pinterest. The boots I would choose are the so cute Suede with side buckle! I will share, repost and tell all my friends and family about your awesome site!! Thank you! !